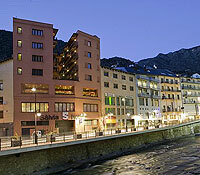 Andorra la Vella is surrounded by a highly mountainous terrain. It’s remarkably isolated for a national capital; getting here is a three-hour drive from the nearest airports (in Toulouse and Perpignan in France, and in Girona and Barcelona in Spain). But the town provides easy access to Andorra’s main ski resorts and has the principality’s best range of services and facilities. Since there are no train stations, you can get here by taking a bus from the L’Hospitalet-prés-l’Andorre station in Ariège, France. There is a helicopter service as well. Andorra la Vella’s population is mainly composed of Spaniards (who make up nearly half of the capital’s residents), Andorrans (a third), Portuguese, and French. It is a small town, but not a sleepy one. The newer, northern half of Andorra la Vella is a bustling commercial area full of shops and restaurants. The other half is the city’s old town, Barri Antic, a charming historic quarter with quaint cobblestone streets and stone houses, and Andorra’s Parliament is housed in a 16th century manor here. The piazza outside it is also the site of many cultural events. In winter, Andorra la Vella holds a music festival here. Andorra la Vella’s territory includes the villages of Escaldes, Engordany and Santa Coloma. On the bank of the Valira River, the village church of Santa Coloma is one of the oldest in Andorra and has been nominated as a UNESCO World Cultural Heritage Site. Modernization has made some serious changes to the once-quiet Barri Antic, Andorra la Vella’s old town. The busy Avinguda Príncep Benlloch cuts through the quarter, and big modern buildings have arisen in the area. But Barri Antic’s most well-known house is still the Casa de la Vall, a 16th century manor that has served as Andorra’s Parliament building for 300 years. Down the street, and closer to Príncep Benlloch, is the 11th century Romanesque Església de Sant Esteve. In the quarter of El Pui, sitting high on a rocky promontory, are some of Andorra’s most important institutions. The beautiful square of Bisbe Benlloch is also here. The Avinguda Meritxell is Andorra’s premier address. 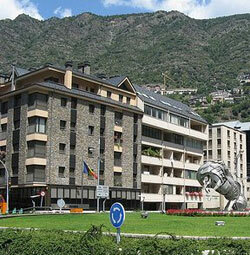 It is the main shopping street of Andorra la Vella, with luxury boutiques, restaurants, bars, cafés and hotels. Store signs bristle from the buildings up and down the street. During the day, the sidewalks are crowded with window shoppers and tourists. In the evenings, the signs are lit up and turn the street into a colourful beacon for night owls.